This post could be titled: “Bruno Goes For A Boat Ride”. 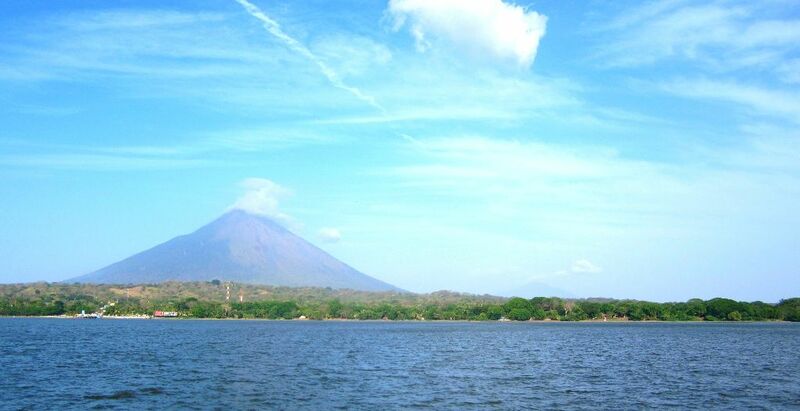 It’s the only way to get him over to Isla de Ometepe with its two prominent volcanoes, out in the middle of Lago Nicaragua. Detailed below is all the gory details for overlanders planning to undertake this wonderful adventure. We arrived at the ferry dock in San Jorge without a reservation to get Bruno on the island. Unsure of how busy it would be, it’s probably a good idea to get here as early as possible. We waited for the next available car ferry, which was at 2:30pm. Know that if you arrive on a Sunday, there are significantly fewer ferries to take you across. Since we didn’t have a reservation, we can’t give much advice on how to get one, but there are phone numbers and a ferry schedule here. Note that only the boats marked “Ferry” on the schedule will take cars across. 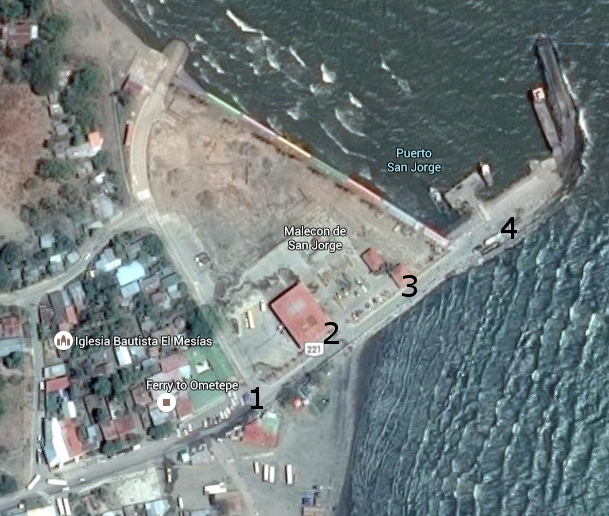 There is only one road that leads from Rivas direct to the lake, and it ends at the ferry dock at Puerto San Jorge. You’ll reach a point where the road is roped off and guarded, you can’t go any further (1 on above map). It’ll just be you and a bunch of cabbies; you’ll want to pull over and park wherever you can. As an overlander, you have now come to realize that your foreign plates behave like a beacon on a dark night, and you will probably be approached by a helper. Someone who may or may not be wearing a badge, knows all about the entry requirements, and for a small tip will very pleasantly assist you. However, with this guide you can do it all very easily on your own and avoid the need for hand-holding. There are security guards manning the roped off road, but you are free to roam back and forth out to the ferry terminal on foot. Walk all the way out straight until you see a small building housing a bodega or snack shop on the left hand side (3 on map). On the way to this building, you will have passed something that looks like an airplane hangar (2 on map). Note this, as you will need to come back here at the end. The bodega is where you can purchase tickets for your own personal ferry crossing, as well as secure a spot for your vehicle on the ferry. 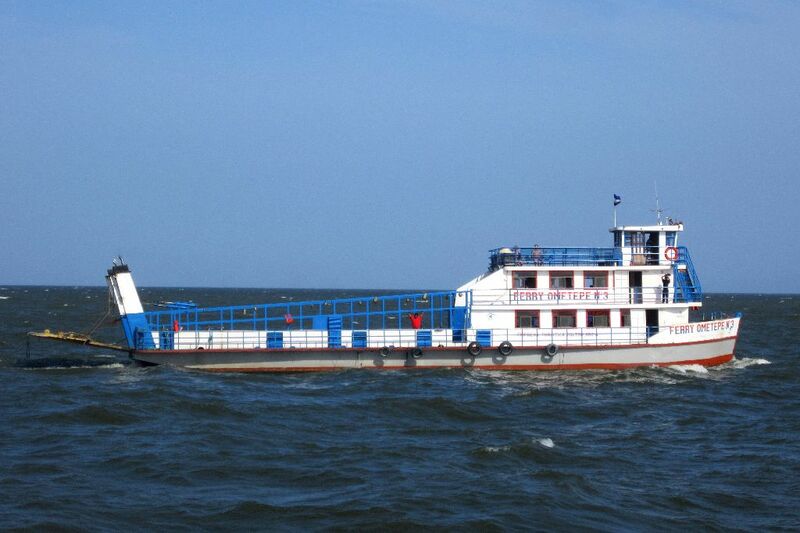 There are a limited number of spots for vehicles on each ferry, which is why reservations are recommended. We were lucky enough to show up and get a spot on the next ferry with only a couple hours wait. At the bodega, you should expect to pay for your trip TO the island, as well as pay and reserve your spot for your return trip back FROM the island. Notice that you did not pay the impuesta/tax for the trip TO Ometepe at the bodega. This is what’s done back at the airplane hangar (2 on map). With your personal ferry tickets, receipt for payment for the vehicle and separate receipt for payment of your return trip, head back to the hangar. There are two cashier windows, where you show payment for the vehicle for your trip TO Ometepe. You pay the 81 Cordobas for impuesta/tax and he hands you a receipt. This receipt is what the guards at the roped off entrance will need to see in order to allow your car through. A reasonable amount of time to enter with your car is ~ 1 hour before your ferry. Once the guards let your car through, wait for the ferry at the end of the dock (4 on map). Someone will approach to check your vehicle receipts and guide you on when the time comes. A final cost will be charged to you upon exiting the island on your return trip. 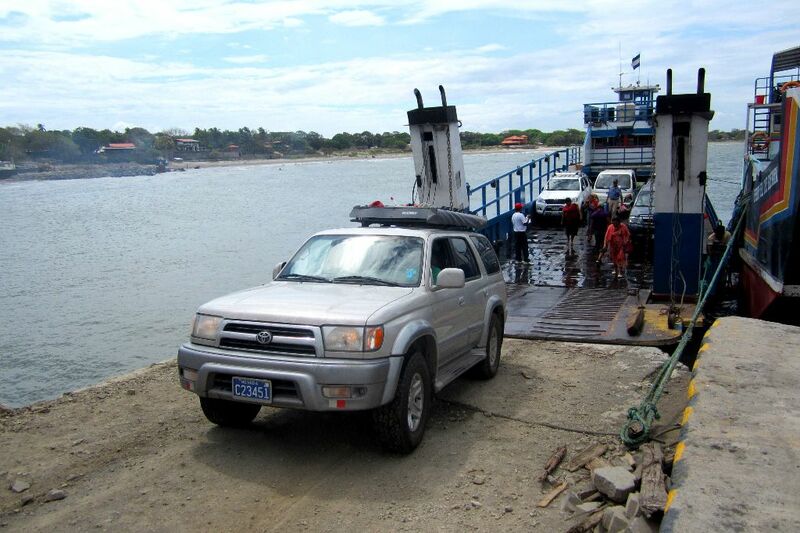 Someone with a clipboard approaches all cars (foreign and domestic) at the dock in Moyogalpa, and charges 50 Cordobas for island exit tax per vehicle. He will provide a receipt. Note that there are no ATM’s in San Jorge, so stock up in Rivas. We only found two ATM’s on the entire island: one was out of money and the other – JACKPOT – actually had money! Many hotels and restaurants will accept credit cards, but we used cash to pay for fruits, veggies, and our campsite. On that line of thought, if you plan to camp and eat your own food on Ometepe, shop in Rivas before heading over. We found a fruit & vegetable market in Altagracia on the island, but it is pretty limited. Enjoy the ~1 hour ride on weekdays, or the ~1.5-2 hour ride on Sundays when EVERYTHING is slower. Buy some cashews from the endless vendors who don’t remember one tourist face from another (you JUST asked us! ok fine, we’ll buy some).